WiT was founded in 1997 with the support of just 10 women. The association has now grown to over 5500 members and affiliates with sponsorship from organisations such as University of Queensland, Origin Energy, Queensland Government, QUT, Griffith University and others. In 2002 the association changed its name to Women in Technology; recognising the relationship between IT and emerging technology fields such as science and engineering. In 2005 WiT launched the Life Sciences (previously Biotech) and ICT Committees, separate streams established to cater to the needs of the organisation's increasingly diverse membership. WiT delivers a range of programs for women of all career levels whether they are starting out or looking to extend themselves at a more senior level. WiT is an icon in the industry to many women and represents the interests of all women in the fields of Information Technology and Life Sciences technology. WiT is one of the leading technology industry associations for women in Australia. WiT is also the first technology industry association to bring together members from diverse technology disciplines. The introduction of our Life Sciences Committee in 2005 has highlighted the common ground shared by women in all areas of emerging technology. Sonja Bernhardt founder of Women in Technology in 1997 is an Australian technology industry identity, Chief Executive Officer of multiple award winning software development firm ThoughtWare Australia and has voluntarily contributed significant efforts to the technology industry. This earned her a prestigious Medal of the Order of Australia (OAM) in 2011. Sonja holds three management and information technology related degrees including an MBA, is a published author, including an international book on “Women in IT in the New Social Era”. She was a past presenter of a long running weekly technology show on Australian National ABC radio. 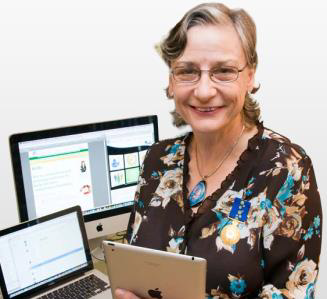 Sonja’s passion for technology and encouraging people to take up technology studies and careers is globally recognized and now in semi retirement Sonja is taking that passion to the high seas as a technology enrichment speaker on multiple cruise liners. 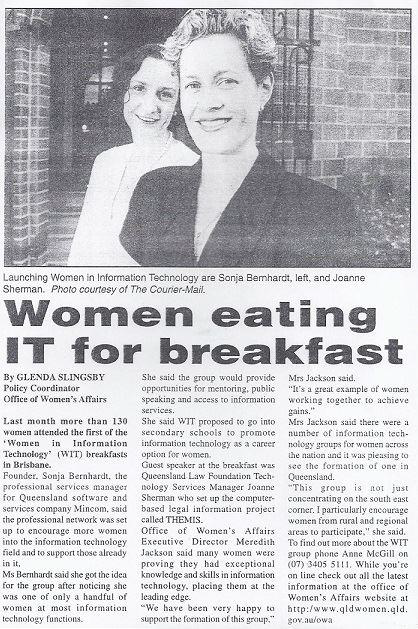 We asked Sonja about the start of the WiT organisation in 1997. "A life-threatening bout of Meningococcal Meningitis in late 1996 resulted in me thinking of the fascinating women I knew who were involved in technology, yet did not know each other. I promised myself that on recovery I would do something about it." In early 1997 two events reminded Sonja of her promise. 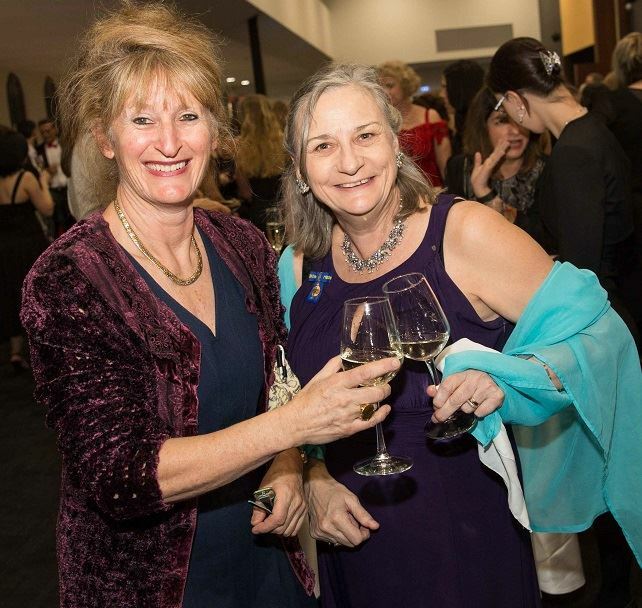 "I attended an AIIA event I felt overwhelmed by the sea of “men in suits” and shortly after a fabulous tech woman, Jane Reid (formerly Hoepner), took me out to lunch and after lunch I literally ran back to work determined to make it happen!" "I called the IIB (information Industries Bureau), where Brian Cordiner advised that, the night before, CEO Liz Manning had assigned funds at a meeting specifically to ‘do something about’ women in technology. And WIT was born." "The IIB pulled together the initial group and granted $5,000 worth of funds." and so we began the journey that led us to WiT's 20 year anniversary this year. 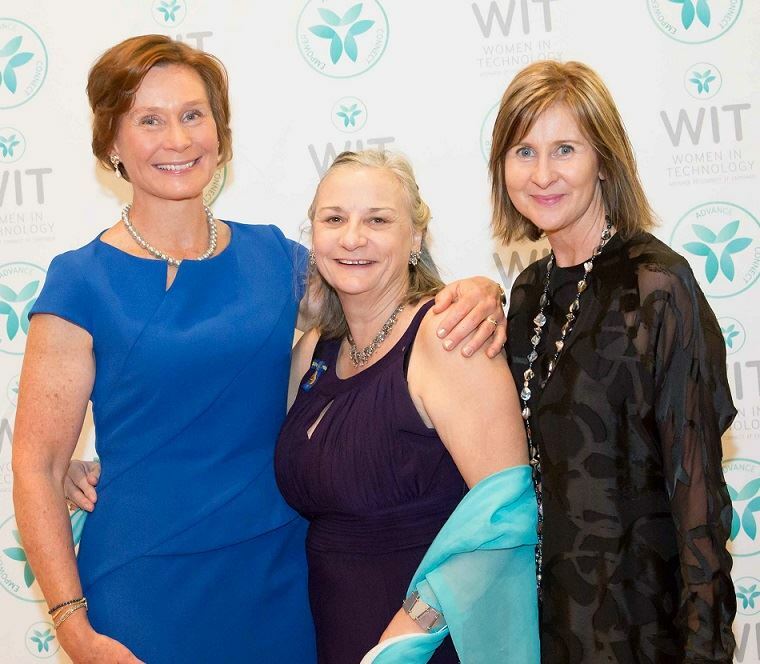 WiT has flourished from 10 founding members in 1997 to over 5,500 members & affiliates due to the tireless dedication of the many volunteer board and chapter members who have written on the pages of the WiT Story. We were honoured to host some of our founding members at our 2017 WiT Awards to help celebrate our 20 year anniversary. In the beginning WiT had the support of just 10 women: Sonja Bernhardt, Jenny Beresford, Anne McGill, Carolyn Hill, Bernadette Hyland, Liz Manning, Yvonne Packbier, Joanne Sherman, Glenda Stone (formerly Slingsby) and Ann Uldridge. Later joined by Sonya Trau (formerly D'Aoust) and Jeanette McLeod. Ann-Marie Birkhill and Carrie Hillyard joined later to start the first Life Sciences Chapter. These brave 10+ women have grown to more than 5,500 members and affiliates and the founding members should be proud of the foundations they laid for such an amazing organisation, their spirits live on. WiT membership is open to women and men and ranges from students through to senior executives. This means catering our services for multiple target audiences.